With a name like “blister beetle,” the Coleoptera family of insects don’t sound like they do much for your health, but they could. U.S. researchers, in trying to find a way to battle cancer, have recently turned their attention to the blister beetle. It has long been used in traditional forms of medicine, and more recently, it has been linked to anti-cancer abilities. Also known as “Spanish fly” and “cantharidin,” blister beetles have long been used in Traditional Chinese Medicine and Vietnamese Medicine. The substance cantharidin, which is secreted by the beetle, is known to block a number of proteins in the body. For this reason, it has been used to battle viral infections, warts, and cancer. Researchers tested to see how cantharidin reacted with certain genes, discovering that it is “potentially useful” in the treatment of tumors. And they weren’t talking about just any tumors, but those that don’t respond to other forms of treatment—the stubborn tumors, the cancers that are very hard to stop. This conclusion supports what the Vietnamese and Chinese have been doing for countless generations. 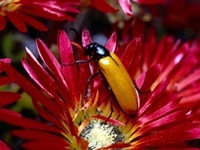 They have used the blister beetle to treat cancer for ages. Blister beetles live in the western parts of Asia and southern parts of Europe, feeding on olive trees and honeysuckle. They can be a variety of colors, but are usually bright green. RECOMMENDED: Is cancer finally on the decline? Urinary tract problems, and insect bites. Most important, it is a remedy given for health concerns that are causing burning pain. And now cancer, which can cause burning pain, has been added to the list of ailments cantharidin can help. Rauh, R., et al., “Molecular biology of cantharidin in cancer cells,” Chinese Medicine,July 4, 2007;2:8.